Jane Baraz, MA in Psychology, has been a mindfulness practitioner since 1976 when she began sitting vipassana retreats. She was on the Spirit Rock Board of Directors for 8 years, helped start the Spirit Rock Family Program, completed the Dedicated Practitioner's Program and is currently in the Heavenly Messengers Program. Jane teaches Mindfulness Based Stress Reduction (MBSR) at UCSF's Osher Center for Integrative Medicine. She's also a trained teacher in Mindful Self-Compassion (MSC), which she teaches at the Women's Cancer Resource Center in Oakland and privately in Berkeley. 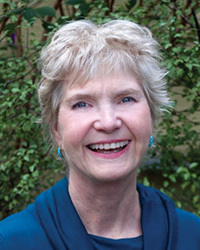 Jane enjoys teaching Awakening Joy workshops with her husband, James Baraz, in California and internationally.